Reliance Jio Extended Till March 2017 : Hello Guys , Today We Have A Exciting News For All Jio Users . Mukesh Ambani , Founder Of Reliance Jio Has Officially Announced That Jio Services Will Be Continued Till 31st March 2017. 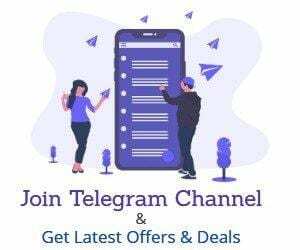 Reliance is calling this the Jio Happy New Year Offer, under which all existing as well as new customers will be eligible for free data until this period.This Is A Very Good New Year Surprise From Mukesh Amabani And Jio Telecommunications . You Don’t Need To TO Extra Steps For This Offer All Old Sim Will Automatically Upgraded Till 31st March 2017. Jio Recently Also Launched Free Home Delivery Service So If You Have Not Yet Purchased Jio Sim Just Go throuh This post. Jio Acquired 50 Million Users In Previous 80 Days , Now They Want To reach This Target To 100 millions . Go to Jio Website From here . After Submitting Details A Jio Executive will Come to your address after few days just show your adhar card for Verification . Your Sim Will be activated within few minutes Using your eKyc Documents. Done, Now Use your Jio Sim In Mobile . 6. 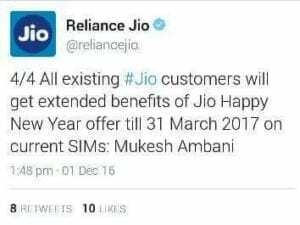 The offer will automatically convert to Jio Happy New Year Offer On 1st January 2017. 7. Just enjoy Jio Services Till 31st March of 2017. 8. You can also port your number into Jio. Inter connectivity problems – customers facing Busy line message when dialing to other netowrk like Airtel,idea , vodafone and others because the market is already owned by other telecome companies so it will be difficult to have such sim which can’t connect with other operators, weather it’s cheap or not . it free call feature is just useless . Jio capped down its data speed to equivalent 3G network. at the time of launching customers were getting high speed upto 7Mbps but now maximum sped is 500Kbps.this is also a great disappointment for customers. Jio uses a Fare use policy you will get 4G speed only for 4Gb data and then you will get speed upto 128kbps. It works on Volte version so the phones which only support 4G LTE have to install the Jio4gvoice app . the app is not so user friendly and often return with error “enable to establish call” . in LTE phone you can use messaging and calling only via this app.